Zero calorie butter spray actually has calories. Sure, if you use the recommended "serving size" (a couple of sprays), I Can't Believe it's Not Butter spray is fat and calorie free. But when you use a more realistic portion, the calories and fat rack up. The average real serving is about 15-25 sprays, which contains about 20 calories and 2 grams of fat. And obviously, the more you spray, the more calories and fat you add. The numbers are still fairly low, but this butter substitute certainly does have calories. And fat. So be careful! A word to the wise (or should we say, a word to <?/x-tad-bigger><?x-tad-bigger>your thighs<?/x-tad-bigger><?x-tad-bigger>?). Something can be labeled "fat free" even if it is 100% fat. The FDA says that a food can be called "fat free" if it contains less than a half of a gram of fat per serving. So, as long as the serving size is small enough, the package will read "fat free" even if it contains lots of fat. That means if you eat more than one serving of a supposedly "fat free" item, there's a good chance you'll be taking in a gram of fat or more. Fat free whipped cream (like Reddi-Wip) is a great example. The can says fat free, but if you eat more than one serving (which you most likely will, since there are supposedly 40 in that can! ), chances are you will be taking in a few grams of fat. Serving sizes are often unrealistic. Are there really 16 servings in that box of cereal? Two servings in that small can of soup? Five servings in that teeny tiny chocolate bar? Um, not a chance. However, companies hope you won't figure out that you have to multiply the calories, carbs, etc. 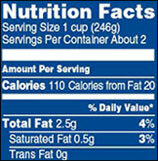 listed on nutrition labels by the number of serving sizes, to get accurate nutritional information. To get more realistic numbers, multiply all nutritionals by the number of servings something <?/x-tad-bigger><?x-tad-bigger>supposedly<?/x-tad-bigger><?x-tad-bigger> has. That will tell you how many calories, etc. are in the entire package. Then divide by the <?/x-tad-bigger><?x-tad-bigger>actual<?/x-tad-bigger><?x-tad-bigger> number of servings you believe are <?/x-tad-bigger><?x-tad-bigger>really<?/x-tad-bigger><?x-tad-bigger> in the package. Warning: The results may be upsetting! Frozen yogurt isn't always better for your diet than ice cream. Take Ben & Jerry's Phish Food, for example. It has 220 calories, 4.5 grams of fat and 41 carbs per 1/2 cup. You're better off with an ice cream cone from McDonald's. It has 150 calories, 3.5 grams of fat and 24 carbs. Read labels carefully. Today is National Nutty Fudge Day. Your average serving of the stuff contains about 450-500 calories and 25g of fat. Skip it! Spread the word...share this email with everyone under the sun. Click "send to a friend" NOW!